It's no longer if we could, but rather if we should. There are four main avenues that the cooperative are walking down in an attempt to achieve human immortality. Each step reflects a chronological step in the project, with each stage representing a further degree of disembodiment. Avatar A aims to give the human brain control of a remote humanoid robot by using a brain-computer interface (BCI). While this might seem outlandish, we must remember that controlling robots using thought — the most rudimentary aspect of the project — was achieved a decade ago. This technology has been accelerated by recent advancements in the field of prosthetics, which show that the human nervous system is capable of interfacing with prosthetic enhancements. 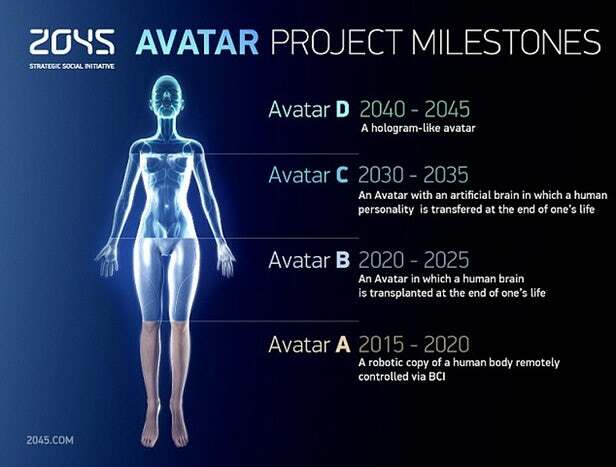 Avatar B, rather than controlling a body remotely, seeks to implant the brain into the body itself. The process envisioned is to ‘turn off’ the brain, relocate it (metempsychosis), and then transplant it. As the brain, theoretically, would be in a robotic body, this stage creates a consciousness inhabiting a body that could be modified, augmented, or updated. Avatar C, the next stage of embodiment, envisions a completely robotic body that the brain could be uploaded to. Hypothetically, this would require hardware and software solutions that could allow consciousness to be uploaded, and subsequently inserted, into a totally robotic body — or potentially many bodies. As the brain would become computerized — rather than it remaining as fleshy matter controlling a machine — this would allow the brain itself to be customized and the sentient robot, as a whole, to survive what a human body could not. Whether or not this technology will be actualized is a moot question: it will eventually come about, perhaps even as soon as 2045 — as Kurzweil has predicted. The more important question is: should or shouldn’t it arise. The possibility of immortality could have profound effects on the individual, as well as society as a whole. There are both positives and negatives concerning the idea of eternal youth. Immortality could mean that we would no longer suffer the fear of death, we could do more with our lifetimes, and the world’s greatest minds could continue to develop their thoughts. However, there could also be a strain on resources, serious psychological problems associated with extreme age, and stress on societal structures such as marriage and parenthood. This dilemma is reminiscent of Ovid’s Cumaean Sibyl: she asked for eternal life rather than eternal youth. Apollo, therefore, let her rot — but kept her alive until she deteriorated into being kept in a jar, when she became only a voice. Taking the story’s moral to heart, we must constantly consider what we are wishing to achieve by attaining eternal life: whether this journey is towards a tangible and positive gain or whether we are simply scared of dying. Hopefully it is the former, or else we run the risk of being nothing more than a voice in a jar, an imitation of life.